Structural Sustainability Across the Globe - U.S.
Sustainability Across the Globe – U.S. While we have observed ways in which structural engineers achieve sustainability, it remains important that we holistically understand the purpose of sustainability. More importantly, we must understand how our surrounding environment is affected by the structures we design. The general message remains just about the same despite the language being spoken, but the influencing factors behind sustainability will ultimately vary based on the global region. This blog will explore sustainability across the globe, but specifically in the regions surrounding DeSimone’s office locations: New York City, Miami, Boston, Las Vegas, and San Francisco. When it comes to understanding sustainability, the United States is perhaps the most complex. Cities and states greatly differ in terms of weather, population density and building density. With five locations across the country, each DeSimone office has to account for the aforementioned factors when determining their sustainable approach. 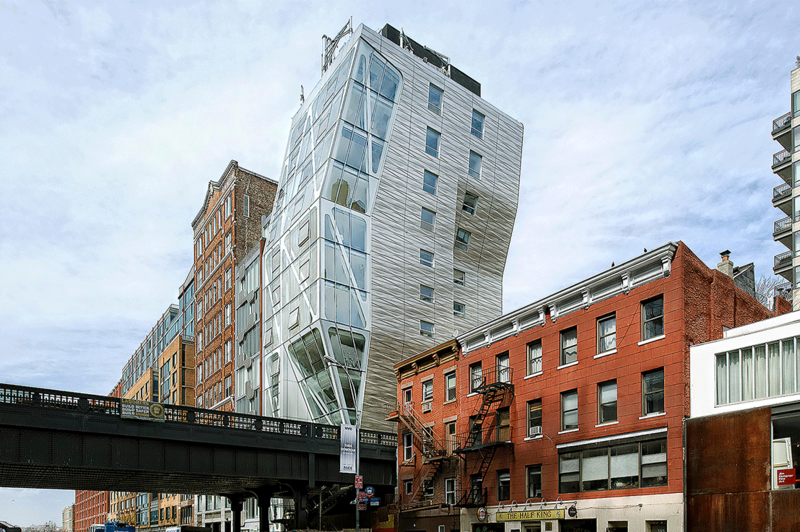 HL23 is one of NY’s luxury residential buildings that is a LEED Gold-certified structure. Of all of the firm’s office locations, New York City takes top honors in population and building density, which means greenhouse gases and storm water management are brought to the forefront. The City’s drive toward sustainability began in 1997, when the New York Department of Design and Construction created the Sustainable Design unit to identify and implement cost-effective ways to promote healthier environments. By 2012, more than 65 projects helped reduce greenhouse gas emissions by 2,021 metric tons per year, and saved nearly 6 million gallons of potable water use annually. A changing climate, a growing population, aging infrastructure, and an evolving economy means designers must find ways to mitigate climate change while also preparing for the risks it presents. As such, we have seen a shift in how we approach new construction as we take these factors into account. It’s even brought about visions of a concrete jungle converted to a self-sustaining city, where green roofs turn our run-of-the-mill skyscraper into food-producing towers. Sustainable Spotlight: HL23 was designed by L.A.-based architect Neil Denari and completed in 2011. Standing 14 stories tall, it totals over 42,000 square feet and is considered to be one of the city’s top new luxury residential buildings. As a LEED Gold-certified structure, it embodies what a sustainable design in New York City can achieve. Its sustainable features include 100% green energy, recycled building materials, water-conserving fixtures, and a highly reflective roofing material. Other sustainable features include recycled and low-VOC paints, finishes and adhesives; high-efficient boilers and LEED-certified perimeter heat systems; and a cooling tower with sound attenuation. The electric elevator additionally reduces energy consumption by functioning without the support of a machine room. 1450 Brickell is LEED-Gold certified and seeks to be environmentally conscious. The state of Florida has become a hotbed for developers as new developments continue to transform its major cities. However, it has been Miami that has seen the biggest turnaround of all Florida cities with an up-and-coming luxury residential market driving the sea change. The city has even seen some of the world’s best architects are leaving their mark, with projects like One Thousand Museum, Grove at Grand Bay, Surf Club, Miami World Center, and the Faena House. The rising sea levels around South Florida are probably the most important issue currently facing the megalopolis. As a countermeasure, developers are utilizing new construction methods, such as innovative HVAC systems, passive cooling methods and various ways of reusing water. Miami Beach is also beginning to elevate its streets, install improved street drainage and pump stations, and the green initiatives happening so far are only a small sample of what is to come as the city’s advancement continues. Florida has gone so far as to develop the Florida Green Building Council to promote sustainability with environmental, economic, and social benefits through regional education and certification programs and awards projects based upon the green building standards. Even at the local level, Miami-Dade County has incorporated its own sustainable building measures, which ensures that facilities owned, financed, and operated by the County followed stringent sustainable guidelines. Furthermore, all new projects owned by Miami-Dade County are required to obtain a minimum LEED Silver certification, while County-owned remodeling and renovation projects are to obtain a basic LEED certification. The County has also created Green Print, a plan that integrates with existing plans to best protect resources, such as wetlands, agricultural areas, and water well fields. Honing in on the city level, the City of Miami initiated the Miami 21 Zoning Code in 2010, which provides a clear vision for the City that is supported by specific guidelines and regulations and allows future generations to reap the benefits of well-balanced neighborhoods and a rich quality of life. It requires that all new buildings achieve at least a LEED Silver Certification and, as an incentive, the city allows incremental Floor Lot Ratio (FLR) bonuses for certifications of Silver, Gold, and Platinum. Additional incentives include expedited permitting and utility rebates. Sustainable Spotlight: In earning its LEED Gold certification, 1450 Brickell has set a new standard for sustainable design and construction of new commercial office buildings in Miami. As tenants seek opportunities to become more environmentally conscious in line with their business principles, properties like 1450 Brickell stand out from the competition. 1450 Brickell features a range of efficient strategies and technologies that enhance the health and productivity of its tenants while reducing waste and promoting environmental sustainability. The projects sustainable highlights include: Having approximately 78% of the project’s construction waste recycled, with 40% of all materials coming from sources within 500 miles of the construction site; a design that conserves 14% more energy than standard buildings built to code; the utilization of low-flow water fixtures that are projected to save over 2.5 million gallons of water per year (more than 40% over standard buildings built to code); preferred parking spaces allocated for low emission, fuel-efficient vehicles; and 44 bike racks, and shower and changing facilities. 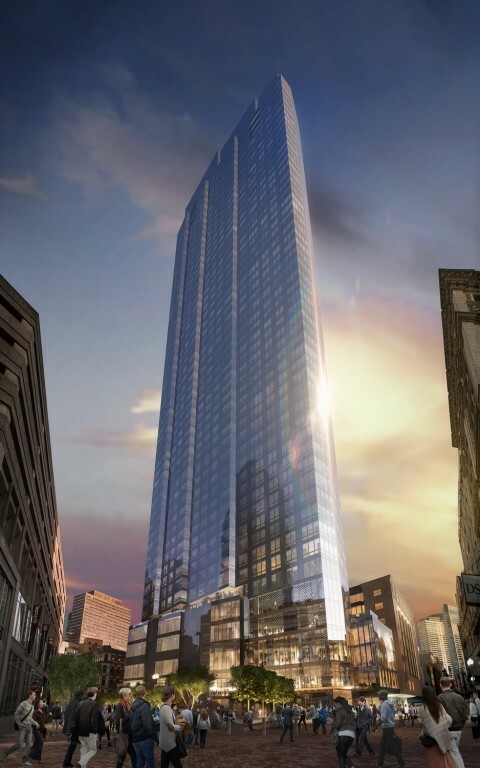 Millennium Tower, Boston’s fourth tallest building, will include 500 luxury condominiums and up to 190,000 square feet of retail. The historic city of Boston is not often associated with major development, but that has changed over the last decade. The focus has shifted to construction of high-end luxury buildings and redeveloping underserved areas, with the buildings such as Millennium Tower and Lovejoy Wharf part of that renewed focus. As such, in 2007 the city of Boston became the first city in the nation to require a green building standard through municipal zoning requirements. The city has made it a point of emphasizing sustainability, and they have developed their own sustainable affordable housing community. Former Boston Mayor Thomas Menino has also formed the Green Building Task Force to encourage and promote sustainable development within the city. Las Vegas hopes that City Hall will be the city’s turning point for sustainability. The Las Vegas strip, known for its flashing lights and the world’s best casinos, has been reinventing itself as a model of sustainability. The city currently has one of the highest concentrations of LEED-certified buildings in the world, thanks in large part to the state legislature that incentivized green development and inspired Nevada’s LEED projects to leap from a total of 14 in 2005 to 97 in 2007. One of the largest problems that faces the region, because of its arid climate, is water scarcity. Nevada is one of seven states that depends on the over-burdened Colorado River for its water supply, meaning water conservation has become one of the core elements of sustainable design in Las Vegas. Another area that effects Las Vegas is the amount of waste generated, with nearly 500,000 tons of waste a year contributed by casinos alone. Most of this used to go straight to landfills, but now, plastic, paper and aluminum products are compacted and sold on the open market, food waste is either sent to a nearby pig farm or composted, and the oil that is used in cooking is collected and converted into biofuel. 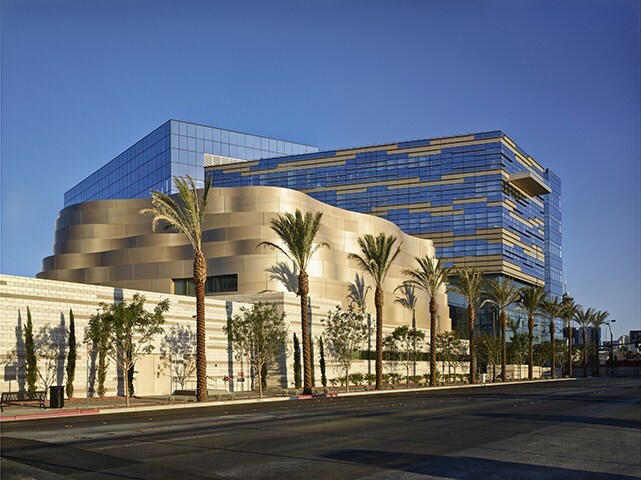 Sustainable Spotlight: Las Vegas City Hall, which is removed from The Strip, might very well be considered the turning point for the city’s downtown area. This LEED Gold-certified building designed by Elkus Manfredi Architects has a number of sustainable elements indicative of what this region hopes to achieve with new sustainable construction. The building’s orientation maximizes heat gain, it has a highly reflective roof, uses direct evaporation cooling of outside air, and uses low-flow plumbing fixtures to conserve water. According to the Green City Index, San Francisco is the greenest city in the US and Canada, meaning that the city is in a bit of a predicament. While other cities attempt to adapt to the sustainable movement, San Francisco is trying to continue to lead the way on sustainability and innovation. The City and County of San Francisco has created the San Francisco Department of the Environment (SF Environment), whose mission is to create visionary policies and innovative programs that lead the way toward a sustainable future. Their goal is to lead by example, holding city government buildings to some of the highest green building standards of any city in the nation. Their green building program looks to address the challenges of climate change while enhancing the city’s economic and social health. The city offers a wide array of incentive programs to maximize a developer’s return on investment for both new buildings and the renovation of existing building.